Kogod students and faculty assemble for Sapir's speaking event. Seeking out the next challenge: that’s how Michael Sapir, founder and chairman of Bethesda-based ProShares, got to where he is today. 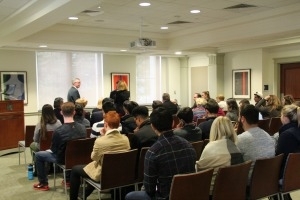 The finance guru sat down with Kogod students and faculty on Wednesday as part of the Meltzer CEO Speaker Series. Sapir explained what it’s like managing $32 billion accounts and shared some priceless advice. For Sapir, the drive to succeed started at an early age. As the last of three boys in his family, Sapir always felt competitive with his brothers. “I wanted to exceed expectations and show my brothers l could succeed,” Sapir said. In 1997, Sapir and a few partners set up a mutual fund company that allowed investors to move their money out of the account for use anytime--a far cry from how mutual funds usually operated. Sapir’s model allowed for active trading of mutual funds, embedded leverage, and inverse funds. The company’s goal? $100 million in two years. Sapir says that only nine months after they opened, they reached it. A year later, they hit $1 billion in assets. Not long after starting ProShares, the team heard about Exchange Trading Funds (ETFs). ETFs are mutual funds that trade on a stock exchange throughout the day, and can be bought like stock through a broker firm. Sapir was hooked. It took six years of planning to launch the ETFs, but his leap of faith paid off. The ETFs hit $15 billion in assets in a year and a half. “Sometimes you must jump in the deep end of the pool and learn how to swim,” Sapir advises. Sapir is sure Kogod students are equipped to successfully tackle new business challenges. “The industry is changing so much that there are endless opportunities. There are many ways to be successful,” Sapir says. And gaining insight like this is a great first step.